Changing Lives through Horses is an innovative initiative supporting disengaged and disadvantaged young people in developing key life skills and the desire to return to education or employment. This programme is aimed at young people aged between 14 -16 years-old before they fall into the NEET (not in education, employment or training) category. The BHS believes that horses have a remarkable role to play in impacting on a young person’s life when other methods have not been successful. One in four young people struggle with low self-esteem, wellbeing and mental health problems. This is the highest level seen in over eight years. The situation is even worse for NEET young people worried about their future. 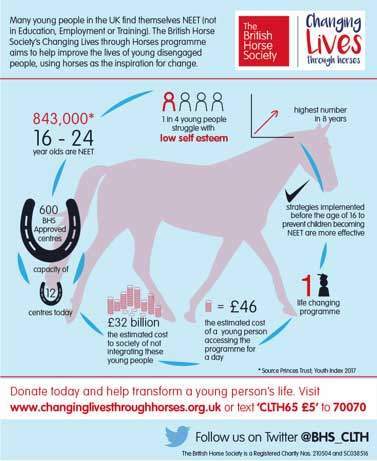 Research shows that approaches like Changing Lives through Horses can help prevent young people from becoming NEET. In September 2016, 843,000 young people aged 16-24 years were not in education, employment or training1, at risk of becoming socially excluded with income below the poverty line and without the skills to improve their economic situation. The programme uses the unique equestrian environment to provide them with a natural sense of structure and responsibility. By working with horses the young people are able to connect once again with society and improve their wellbeing. Together, this combination helps assist the development of essential skills for the rest of their lives. 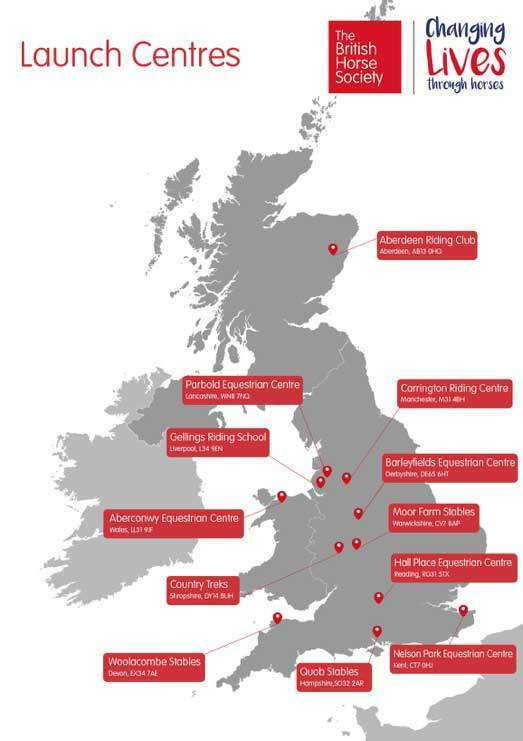 The BHS has launched and piloted the Changing Lives through Horses programme through 12 selected BHS approved riding centres across the UK. (See map below). Each centre has skilled coaches to support the development of life skills with horses. The BHS is working in partnership with secondary schools and youth organisations. As well as other wellbeing and mental health charities; Place2Be, Riding for the Disabled Association, Athletic Community Trust (CACT), Youth Sports Trust, UK Youth and Learning through Landscapes. This programme relies on public donations and grant funding.